Utforsk den vakre naturen i Amalfikysten på denne dagenstur fra Sorrento. Se førstehånds hva som har gjort Amalfikysten til en lekeplass av kjendiser i flere tiår, gå i fotsporene til Humphrey Bogart og Greta Garbo. Len deg tilbake og nyt utsikten på bussen fra Sorrento til Positano, Amalfi og Ravello. Måltider er på egen bekostning. Styr din luftkondisjonerte buss utenfor ditt sentrale Sorrento-hotell (eller på et annet sted i nærheten, hvis hotellet er utilgjengelig for trenere) og møte din guide for å starte dagenstur langs Amalfikysten. Sett deg inn i setet ditt og blikk ut vinduene ved det glitrende havet eller terrasserte hager og pastellfargete bygninger, avhengig av hvilken vei du ser. Din første stopp er Positano, en tiered landsby bygget på siden av klippene. Tilbring noen få minutter å fange den berømte utsikten med kameraet ditt - eller bare minnet ditt - før du hopper tilbake på treneren til neste etappe av reisen - byen Amalfi. Utforsk Amalfi i ditt eget tempo, besøk den ikoniske, flerfargede katedralen fra det 9. århundre eller bla gjennom butikkerne langs byens sidegater. Du kan til og med ordne med å ta en båttur til de nærliggende små landsbyene Conca dei Marini, Maiori og Minor (egen regning). 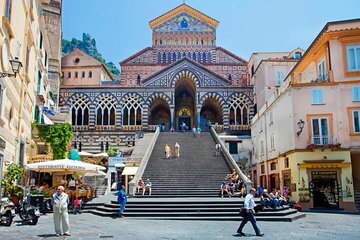 Etter å ha besøkt Amalfi, går du på bussen igjen for å klatre opp til bakketoppen Ravello, din siste stopp. 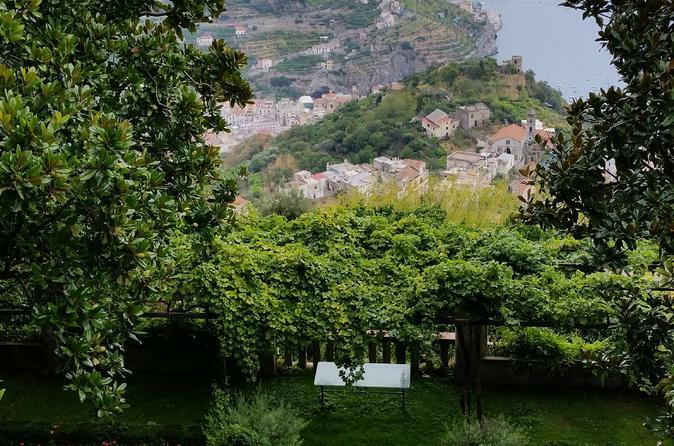 Denne lille byen er kjent for to villaer som begge har store hager og fantastisk utsikt over havet - Villa Rufolo og Villa Cimbrone - og du vil ha fritid i Ravello for å se dem selv. Soak i flere av Amalfikysten berømte utsikter på bussturen tilbake til Sorrento, hvor turen din er ferdig tilbake hvor den begynte. The whole day was great. Interesting to read others reviews as it would appear our experience was very different. Rossella was a very informative guide but we did not have the trip experience advertised. When we arrived in Amalfi we were ushered into a doorway for an overview of what Amalfi had to offer this took fifteen minutes away from our time there to explore which in the end was an hour. We were then taken to a hotel in Scala not on the itinerary. Tables had been reserved here for our party. We were not happy and expressed this to Rosella who told us to just sit in the bar and wait whilst everyone else had the set menu. Our whole objective of going on this trip was to see the towns listed not sit in a hotel very similar to the one we were staying in to eat a three course lunch with wine that the hotel were refilling into used bottles. We expressed our concern to the guide she assured us it would only be for 45 minutes. In the end it last an hour and half and we felt hijacked. We rang her after and hour and fifteen and she just said it wont be long now. We could not go anywhere but in fact we were five minutes drive from Ravello. We then got a total on an our in Ravello which was not enough time to visit any of the villas. The trip took a total of 11 hours from start to finish. The start was 45 minutes late at the pick up and in total we got two hours in the towns we wanted to visit with the best part of the day spent in the hotel which was obviously a pre--booked arrangement, this should be clear on the trip details as the opportunity to find nice restaurants and eat authentic food in Amalfi and Ravello is a big part of the trip for most people. The views were great and the traffic horrendous but that is nobody fault but its disappointing that we did not get the tour we bought. One of our party has very specific food allergies and would not have chosen to be pushed into a situation where she ate in a hotel mass produced lunches without prior reviews and advance warning of her allergies. If this is the itinerary it should be very clear at the the time of booking. It was a good route, though the guide didn't give much of information - could be better. This was a lovely day out. The boat trip was good but do not do it if you want to spend longer in Amalfi which is lovely. We did not have long enough to spend in Amalfi for me. The microphone on the coach did not work but this was not the fault of the tour guide. ALMAFI, Positano, Rovello, they were all breathtaking. All of the tours throughout Italy did not disappoint. YES and YES! they are worth visiting. You won't be disappointed. This is a wonderful way to experience part of the Amalfi Coast without the stress of driving yourself and trying to park! The tour hits the highlights. You don't get to go into Positano so if that's important to you, drive yourself. If possible, do sit on the right side of the bus but don't worry, the view is spectacular from every seat and stop. The first stop at the Ceramic Shop is great for photo ops and if you want to spend the money, a look at the Emerald Grotto. I think a good number of their items for sale however are made in China, not in the Sorrento region. I noticed another ceramic shop across the street when we were leaving. Amalfi was my favorite stop and I wish there was more time spent in this location. We took the boat ride which was so well worth the extra money to see the coast from the water....breathtaking! However, if you want more time exploring the shops, the church, etc., don't take the boat trip and don't have a sit down lunch. Ravello was nice and quaint with great landscape and water views but I would rather have had more time to explore in Amalfi itself. We hit a Limoncello producer on the ride back which was fun and a neat stop. It's a long day but so well worth it! I traveled with family there were six of us. This trip was one of the top five highlights from our Tour of Italy. It was a great tour of the Amalfi Coast! Rosella knew her stuff. The only thing I would say was that the speakers inside the bus were toooooo loud! Otherwise, I had a lovely time. We had a decent amount of time in each location and it was truly a dream come true for me! This tour was a fantastic use of a day, we thoroughly enjoyed seeing so much of the beautiful Amalfi coast. We had a very small grou, only 11 of us, which meant our tour was quite intimate and we heard lots of interesting things from our guide, who was very knowledgeable. We were offered the opportunity to have a 12 per person boat ride 45 min at Amalfi which was AMAZING - we had decided against doing a boat day trip since we were only in Sorrento for 4 days so this was perfect for us! Would have been nice to know in advance as we would have taken more money with us though. We loved wandering around Amalfi and Ravello and took hundreds of beautiful pictures of this unique coastline. The only other thing is that the tour was due to end at 5:30 so when we packed back onto the coach in Ravello at 2pm we presumed it would be a looong drive home. However, we were dropped off in Sorrento at 3:30pm, so we felt like we could have had more time in Amalfi or Ravello since our tour ended early... Despite this, this tour is so reasonably priced it was well worth it, I would still highly recommend it! Die Reiseleiterin war überaus freundlich und sympathisch. Die Reise war als deutschsprachig angekündigt, wurde aber eigentlich in Englisch durchgeführt. Die deutschen Übersetzungen fielen nach kurzer Zeit aus. Trotz Aufforderung änderte sich das nicht. Die Informationen waren sehr spärlich und bezogen sich überwiegend auf den Reiseverlauf. Beautiful scenery, very enjoyable trip. I would have preferred more quiet time without narration by the tour leader to simply enjoy the scenery.